Famed philosopher George Santayana once said that "those who do not remember the past are condemned to repeat it.” Over the last one hundred years our world witnessed the Holocaust, countless wars and the genocide of millions of people. All these events noted above occurred in a short period proving that remembrance alone is not the issue, the aim is to stare at the root causes that led to these mass atrocities and raise awareness about them so that they will not be repeated. As of today, the Greek Minister of Education Nikos Filis can be considered a persona non grata. During an interview on STAR channel late on Monday night, Filis refuted the occurrence of the GENOCIDE of the Greeks from Pontus which we all know involved the slaughtering of well over 350,000 thousand innocent men, women and children. He instead said that the butchering of the Greeks in the Black Sea region by brutal Ottoman Turks was simply a case of ethnic cleansing rather than genocide. "I said that as a historian, considering the positions of many historians and international relations experts. We made a distinction between bloody ethnic cleansing and genocide as a phenomenon. This does not mean that we do not recognize the blood, pain and everything that Pontic people have suffered due to the cruelty of Turks. But genocide, as a strictly scientific term, is something different," said Filis. During the interview he noted that this was his personal opinion, because, as he so eloquently noted, he did not want to impose his personal opinion as a state policy. What a laugh. He thinks we are totally oblivious to history, as well as his party’s sins on this subject (which will be disclosed further below). His opinion was obviously not received well, and many people took offense to his words and for good reason. So why is all of Greece so angry at him today? For one, his comments are aligned to those of the Turkish government which does not recognize any genocides (Greek, Armenian and Assyrian). Most importantly it is against Greek national interests. What is worse is that there are already some reports circulating on the web today saying that he even did Ankara a diplomatic favor by saying this. In my opinion he repeats the views which have already been expressed by other neocon Greeks such as Maria Repoussi (former MP for DIMAR). Some may recall that a couple of years ago she attempted to make us believe that the massacre of Greeks in Asia Minor, or Smyrna, was nothing more than a gathering at a Turkish port. This scandalous view was even documented in school text books. Thankfully the textbooks stopped being circulated but her views and attempts to push her interpretations of history as truths never did. Not only did she provoke our sentiment in the past when she walked out of the Greek parliament when they held a moment of silence over the Greeks who perished in these genocides, but she has also proposed that Greeks forget about other historical events too! Don't take my word for it, check out the information for yourself on Wikipedia: It notes that the SYRIZA Leftist newspaper "Avgi" had the initiative for freezing the application of this law. At the time, the subject became the center of a political debate between various Greek politicians, with the left being against it. The president of the left-ecologists coalition Synaspismos party Nikos Konstantopoulos and A. Elefantis, known for his books on the history of Greek communism, were some of the politicians who expressed their opposition to the decree. It should be noted that SYRIZA's previous title was Synaspismos. Thankfully, not all Lefitsts agreed with their rhetoric. The non-parliamentary left-wing nationalist intellectual and author George Karabelias bitterly criticized Elefantis and others who opposed the recognition of genocide and called them "revisionist historians". He even accused the Greek main-stream left of a "distorted ideological evolution". He said that for the Greek left May 19 is a "day of amnesia". On its part, the Communist Party of Greece (KKE) has over the last decade adopted the term "Genocide of the Greeks of Pontus" in its official newspaper Rizospastis and since then it even participates in memorial events. Therefore there is no room for excuses about so called "opinions" because we now know the stance that the SYRIZA party has had in the past on this very subject. In any case, Filis and all of the SYRIZA party, have pledged an oath to respect the decisions of the Greek parliament. He should keep in mind that when he speaks he is not representing himself, his party's distorted ideological views, or the people who only voted for him, but he is instead representing the government of all of the Greek people (Pontian Greeks included). As such, I decided that this would be another teachable moment, both for Repoussi and Filis, as well as all those who live in a make believe world that wants us to paint visions of sugar plums and rainbows when we refer to Turkey and its past crimes. According to Wikipedia, in December 2007 the International Association of Genocide Scholars (IAGS) passed a resolution (with an "overwhelming" majority) affirming that the 1914–23 campaign against Greeks who lived in the Black Sea region constituted GENOCIDE. Employing the term "Greek Genocide", it affirmed that this population of Greeks were subject to GENOCIDE alongside other groups, namely Armenians and Assyrians. The resolution was adopted on December 1, 2007 and the press release issued by the organization on December 16. "The Pontic people lived in Turkey for well over 3000 years and are descendants of Greek colonists who arrived there long before the ancestors of present day Turks. The Turks, under the founder of modern Turkey, Kemal Ataturk, pursued a deliberate policy of "Turkey for the Turks." It was adopted against the backdrop of the Greek occupation of parts of Asia Minor as spelled out in the Treaty of Versailles. Its purpose was to rid Turkey of its Greek, Armenian and Assyrian Christians. The resulting Greek-Turkish War of 1919-1922 and the defeat of the Greek Army sounded the death knell for Christian minorities in Turkey. The process began with Christian owned businesses being boycotted, leading to bankruptcies and confiscation of property. Eventually intellectuals and community leaders were rounded up and executed." Surprisingly Wikipedia also notes the methods that were used in the massacres. If you think that these events were not recorded then think again. They were documented by American, as well as the German and Austrian diplomats of the time. "Unlike Germany which has taken responsibility for its sins committed in World War II, Turkey still refuses to even admit that these events occurred, let alone apologize for the genocide and ethnic cleansing it inflicted on a helpless population. Not only were the people expunged from Turkey, so too were any traces of their existence. Admitting guilt would entail casting a shadow on Kemal Ataturk. The present Turkish government has gone to extraordinary lengths to quash any attempt to publicize these events throughout the world, including keeping their own people ignorant of their history. To do so would require a reexamination of the very foundation on which the modern Turkish State is built." 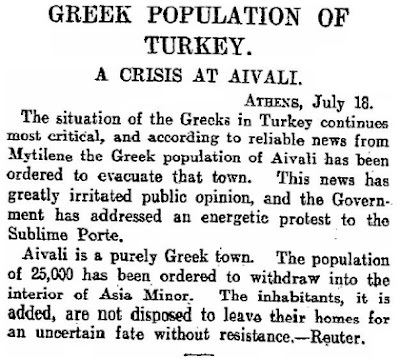 (Source - The Pontic Greek Genocide)"
Today some attempt to rewrite history. Usually this is done by those with a political agenda in a winner take all approach (example George Soros). All they are basically doing is picking up where the perpetrators of a GENOCIDE left off. We can actually see this happening in the mainstream media, through the rhetoric from various neocon scholars, historians and deep thinkers. Not only are all these people in service of the Turkish government, which on its part continues to dehumanize, demonize, and destroy, by putting the "right spin" on all the events that haunt it, they are also distorting history and passing off their interpretations of history as facts. No matter how much they try they cannot rewrite history itself, however their goal is more sinister. By repeating their lies and propaganda over and over again they hope that their views will eventually be adopted by the masses as the only truth. A fine example of this is FYROM. George Soros worked his magic in this former Yugoslav state and today all those under the age of 20, or since the destabilization of Yugoslavia, actually believe that they are direct descendants of Alexander the Great. Everyone with half a brain knows that the Greek, Armenian and Assyrian genocides, were perpetrated by the Ottoman Turks. Even the Kurds, who were once active participants and abetted this genocide with the Ottomans (mostly against Assyrians), have today admitted this fact and now condemn this time in history. Unfortunately they, as well as other Muslim groups in the East, now find themselves in a reversal of roles and have become the target of draconian Turkish policies that are designed to suppress their identity and language. Let us not forget that this is exactly what was done to all of the Greeks who miraculously remained in some parts of Turkey. For Greeks, Assyrians and Armenians, the genocide has not ended, and it cannot end so long as Turkey denies that it ever occurred. This is why Ankara has spent billions on influencing Western diplomats and officials to look the other way, or basically keep silent on this matter. The West, (with the exception of Australia, Cyprus and very few other countries), has surrendered to this decades old denial of the Turkish government deciding that it is more important to placate the neo-Ottomans than to be truthful about history. It is no secret that they have adopted this policy on account of economic, military and geopolitical reasons. Let us not forget that the US has a huge airbase in Turkey that they need for wars in Iraq and Afghanistan. From what we read Turks have threatened to close that base, cancel purchases of American military equipment, boycott American goods and even pass their own resolution condemning 19th century US government massacres of Native Americans (if the US ever did recognize any of these GENOCIDES. Unfortunately there are other more controversial reasons as well. A couple of years ago, Turkey was awash in dramatic disclosures connecting officials there to the right-wing Grey Wolves, the terrorist band which has preyed on the region for years. In 1981, a terrorist from the Grey Wolves had even attempted to assassinate Pope John Paul II in Vatican City. Did Turkey allow the mafia and right-wing extremists to operate death squads and to smuggle drugs with impunity? This I cannot answer dear Frappers, but reports at the time (check link below) claim that the rupture of such state secrets also released clues to other major Cold War mysteries. Do you think that operations such as those noted above died with the fall of the Soviet Union? Apparently they didn't; Operation Gladio B is the continuation of the old NATO Gladio program and geopolitical analysts claim that it covers a tangled web of covert operatives, billionaire Imams, drug running, prison breaks and terror strikes. The same officials believe that the ultimate goal is the destabilization of Central Asia and the Caucasus. You can probably find out more about this subject by just googling Gladio B on the web. I personally am clueless on such operations, because I cannot tolerate any type of violence, but the little that I have read notes that Turkey is once again using such operations to continue its barbarism and genocidal acts in Syria. One recent article that was posted on the web and supports my argument is an interview by Taleb Ibrahim (check link in this paragraph). According to him Turkey's T.Erdogan is displacing people in Syria. 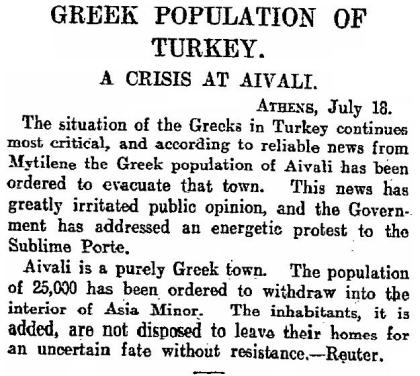 Does the tactic sound familiar to the events endured by the Greeks, Assyrians and Armenians one hundred years ago? It is! He says that the so called rebels, (who we all know now are foreigners that are paid by countries such as Qatar, S.Arabia and Turkey to destabilize this country) are "cleansing" many areas in Syria while Turkey is shipping thousands of Islamist Turks from other Turkish lands there to settle, take over entire villages and eventually bring down the Syrian government of Bashir Assad. In a few words, he reveals how Erdogan is pushing Syrians out of Syria and changing the demographics of this country from Arabs to Islamist Turks (by using ISIS to perform GENOCIDE). Why is he doing this? Aside from his dreams of reviving a new Ottoman empire he is also acting on behalf of many interests that cannot perform these acts because they are acts of war! Even wars have rules and ethnic cleansing, or in this case GENOCIDE, cannot be committed and is considered as a war crime. (View VIDEO by clicking HERE). How can such psychological wounds be healed if a crime is never acknowledged by the perpetrator? To survive ordeals such as a genocide, or to lose your loved ones to such senseless violence, has an undeniable effect on the shaping of one’s character, personality, and general life experiences. Genocide is a grave matter and exemplifies the absolute worst in, or shows its perpetrators to be devoid of, humanity. If Greek government officials are permitted to dismiss these acts, then genocide is trivialized, and a vicious cycle ensues. So now do you understand why we decided to slam the statements by Mr. Filis? Friends, the plight of the Greeks of Pontus, just like the Asia Minor Catastrophe and the Greek-Turkish War of 1919-1922, are events that shaped modern Greek History and that speak to the hearts of all Greeks. The only thing that Pontians want is that the world will come to know of their tragic fate. Those who deny these events, as Filis and Repoussi have done, only help countries such as Turkey to repeat such atrocities again (example Syria). As with the Armenian Genocide, Filis and Repoussi and all Greek neocons opposing the recognition of the Greek Genocide of Asia Minor, attempt to shift focus away from the unfathomable reality of the historical event by portraying the issue as one of nationalism and ethnic conflict rather than of healing and remembrance. My personal feelings about Alexis Tsipras’ government are irrelevant at this point because the facts speak volumes. No government official has a right to express his or her “opinion" on historical facts which have shaped borders and are still considered as fresh wounds by the Greek people. When they make statements –whatever these statements may be- they are speaking as an entity, or a government. If they want to express their personal views then they should get out of office and write a book. To deny historical facts is not only an attack on the morale of the Pontians, who till this day live with this bloody memory, but it is an affront to the dignity of all the victims, both living and dead. Thankfully I am not alone with these views, many ministers from all parties criticised Filis’ statements as did a score of people from all walks of life on the social networks. The main opposition New Democracy party even organized a petition demanding his removal from office as did Pontian Greek associations. The Greek Left, especially SYRIZA, now has a chance to rehabilitate its past and correct the mistakes that it once made on this issue by unequivocally recognizing that what befell on the Greek populations in Turkey was GENOCIDE as defined by the 1948 United Nations Convention on The Prevention and Punishment of The Crime of Genocide. If the government wants to save face then it must immediately scream out the word GENOCIDE, force Filis to apologize to the Pontian people, and then ask him to resign. I will repeat it once again, refusing to say the word GENOCIDE because it will sour Turkey is just another form of aggression and simply allows Ankara to continue with the process of genocide. Most importantly, it prevents the healing of wounds that were inflicted by the GENOCIDE on our people, kills the dignity of the remaining survivors and destroys the remembrance of this tragic crime. A couple of days ago I announced that I would not be posting any articles on HellasFrappe because the blog has not received any donations to maintain itself. Following the latest comments by Filis, I decided to wave this decision and write a special report to voice my opinion on his statements because -as always- when something tugs at my heart, heats up my nerves and provokes my logic I react immediately. As I was researching the material used in this article I came across this video which was posted by a Greek analyst who is an expert on Turkish affairs and then re-posted on facebook by a Frapper. It features a famed Turkish performer singing about the plight of the Pontian people. This should put some neocon Greeks to shame since they regrettably want us to forget, while some Turks, who know the truth, have the courage to even sing it out loud. (Please listen to the words).